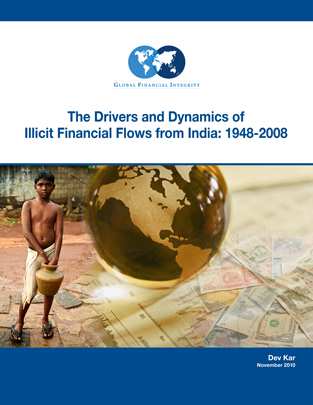 “The Drivers and Dynamics of Illicit Financial Flows from India: 1948-2008,” released in November 2010 by Global Financial Integrity (GFI), estimates that tax evasion, crime, and corruption have removed gross illicit assets from India worth US$462 billion. The report also finds that the faster rates of economic growth since economic reform started in 1991 led to a deterioration of income distribution which led to more illicit flows from the country. Moreover, the report finds that the poor state of governance is reflected in a growing underground economy which in turn has fueled more transfers of illicit capital from India. This analysis is cast in terms of a pre- and a post-reform period spanning a total of 61 years since independence. IFF Trends: From 1948 through 2008 the Indian private sector shifted away from deposits into developed country banks and towards increased deposits in offshore financial centers (OFCs). The share of OFC deposits increased from 36.4 percent in 1995 to 54.2 percent in 2009. (x). Tax evasion is a major component of the underground economy, which in turn is a primary driver of India’s illicit outflows. Expanding India’s tax base and improving tax collection has high potential to curtail illicit flows. harmonize predicate offenses under anti-money laundering laws across all countries that cooperate on the Financial Action Task Force. The author identified the drivers of illicit flows from India using a block-recursive dynamic simulation model which incorporated macroeconomic factors (government deficits, inflation, and inflationary expectations) structural factors (increasing trade openness, faster rates of economic growth and impact of these on income distribution), and overall governance as captured by a measure of the underground economy.